"Maryland Eastern Shore" redirects here. For the university, see University of Maryland Eastern Shore. The northern limit is harder to locate. Some dispute Cecil County as a true Shore territory due to I-95's presence with its surrounding developments, proximity to and influence from nearby urban areas like Philadelphia and Wilmington, and a position straddling the Elk River–leaving 50% west of the Shore. Like New Castle County, Delaware, Cecil County is crossed by the fall line, a geologic division where the rockier highlands of the Piedmont region meet the Atlantic coastal plain, a flat, sandy area that forms the coast. The coastal plain includes the Delmarva Peninsula and hence the Eastern Shore of Maryland. The geology of Delmarva is an inseparable part of the Eastern Shore, which has few rocky outcrops south of Kent County. The Chesapeake and Delaware Canal crosses from Back Creek on the Elk River to Port Penn, Delaware. While it was a shallow canal with locks after its construction in 1829, it was deepened in the early 20th century to sea level, and physically separates the Delmarva Peninsula from the rest of the United States. Maryland south of the canal is considered the Eastern Shore by residents. The term Western Shore is used by Eastern Shore residents to describe all the counties of Maryland west of the Chesapeake Bay, but especially those of the Baltimore-Washington metropolitan area and Southern Maryland. The north-south section of the Mason–Dixon line forms the border between Maryland and Delaware. The border was originally marked every mile by a stone, and every five miles by a "crownstone". The line is not quite due north and south, but is as straight as survey methods of the 1760s could make it. It was surveyed as a compromise solution to a century-long wrangle between the Penn and Calvert families of England. If the Chesapeake Bay/Delaware Bay watershed divide had been taken as the borderline, Delaware would be about half its current size. William Claiborne was granted land (part of the Colony of Virginia) in 1629 and named the land "Kent County". In 1631, he sailed north up the Chesapeake Bay from its south and west side to the area known today as Kent Island. There he made a fortified settlement that is considered to be the first English settlement within the Province of Maryland. Talbot County was formed in 1662. Cecil County was formed in 1674, by proclamation of the Governor, from eastern portions of Baltimore County and the northern portion of Kent County. Wicomico County was formed in 1867, as the 9th and last county, created from Somerset and Worcester counties. 1642 Kent County-In 1642, the governor and council appointed commissioners for the Isle and County of Kent. This act appears to have led to the establishment of Kent County, name after Kent County, England. 1661 Talbot County- named for Lady Grace Talbot, the wife of Sir Robert Talbot, an Irish statesman, and the sister of Cecilius Calvert, 2nd Baron Baltimore. 1666 Somerset County-named for Mary, Lady Somerset, the wife of Sir John Somerset and daughter of Thomas Arundell, 1st Baron Arundell of Wardour. 1669 Dorchester County-Named for the Earl of Dorset, a family friend of the Calverts (the founding family of the Maryland colony). 1706 Queen Anne's County- formed from northern parts of Talbot and southern portions of Kent. Name after Queen Anne of Great Britain who reigned when the county was established. 1742 Worcester County-named for an Earl of Worcester. 1773 Caroline County- formed from parts of Dorchester and Queen Anne's counties. The county derives its name from Lady Caroline Eden, wife of Maryland's last colonial governor of the Province of Maryland, Robert Eden. Ocean City was founded on July 4, 1875,  when the Atlantic Hotel opened on Assateague Island. At the time, Assateague Island was continuous from the Delaware state line to well south of Ocean City: the Ocean City Inlet was not formed until a hurricane in August 1933 cut across the south end of the town, although the inlet was cut not by waves sweeping inland, but by 4 or 5 days' worth of freshwater runoff from the coastal creeks running seaward. By 1935, government money had built jetties to make the inlet permanent, dividing Fenwick Island (north) from Assateague Island (south). Early transportation to the island was by train. Until the 1820s, travel and commerce between the Eastern Shore and Baltimore were less important than the connections between it and Philadelphia. Water travel by sailboat and steamer linked the Eastern Shore to Baltimore more tightly beginning about 1813, when the first steamboat traveled the Bay. By the 1880s, railroad lines linked the Eastern Shore to Philadelphia and later, Norfolk, Virginia, by way of a railroad line straight south from Wilmington to Dover, Delmar, Salisbury, and Cape Charles. Maryland's Eastern Shore was served by branch lines running generally southwest from the main route. See List of railroad lines in the Delmarva Peninsula. The Eastern Shore's many branchlines were built after the Civil War by local companies; eventually all were controlled by the Pennsylvania Railroad (which also bought control of the steamboat and ferry routes), then Conrail and Norfolk Southern. Today the remaining active railroad tracks on the Eastern Shore are operated by short-line railroads Delmarva Central Railroad and the Maryland and Delaware Railroad. An east-west rail route ran from a ferry terminal at Claiborne, west of St. Michaels, to Ocean City, via the Baltimore and Eastern Shore Railroad and the Wicomico and Pocomoke Railroad. Travelers could also take a ferry to Love Point on Kent Island, board a Queen Anne's Railroad train, and travel east to Lewes and Rehoboth Beach, Delaware. Automobile transportation across the Chesapeake Bay was by ferryboat until 1952, when the first Chesapeake Bay Bridge was opened for traffic. In the late 1950s and early 1960s developers began selling lots on Assateague Island, south of the inlet. However, a storm on March 6, 1962 destroyed houses, shacks, and roads. The state and federal governments intervened before reconstruction by creating the Assateague Island National Seashore and Assateague State Park. An Eastern Shore Baseball League operated on three different occasions between 1922 and 1949. It was a Class D minor league with teams in all three states of Delmarva. 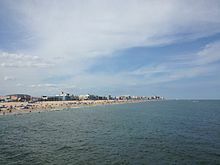 Although the Eastern Shore comprises more than a third of Maryland's land area, it has a population of 420,792 (2004 census estimate), about 8% of Maryland's population. The most populous city on the Eastern Shore is Salisbury, and the most populous county is Wicomico County. The Salisbury metropolitan area is the only metropolitan statistical area, comprising Somerset, Wicomico, and Worcester counties along with Sussex County, Delaware. As a whole the Eastern Shore is considerably more conservative than the more-populated Western Shore. The region has a history of strongly supporting Republican candidates for governor. Republicans Ellen Sauerbrey in 1994 and 1998, Bob Ehrlich in 2002, 2006 and 2010 and Larry Hogan in 2014 and 2018 swept all nine counties. The Eastern Shore has long been a part of Maryland's 1st Congressional district. Democrat Roy Dyson represented the 1st district from 1981 until he was defeated by Republican Wayne Gilchrest in 1990. Gilchrest held the seat until 2008 when State Senator Andy Harris defeated him in the Republican primary. Harris narrowly lost the subsequent general election to Democratic Queen Anne's County state's attorney Frank Kratovil. In 2010, Harris again ran for the district and handily defeated Kratovil after a single term in office. Harris had held the seat without serious difficulty since. In the Maryland General Assembly, the Eastern Shore encompasses a portion of district 35B and all of districts 35A, 36, 37A and 37B, 38A, 38B and 38C. All seats are held by Republicans except for a state delegate seat in district 37A. Ocean City's skyline, containing tall hotels and condominiums, stands out within Delmarva. At the southern end of the town, a recreational boardwalk spans over thirty blocks, containing carnival rides and games, restaurants, bars, arcades, and clothing boutiques. Tourists visit St. Michaels on a neck surrounded by water; the colonial former port of Oxford; Chestertown; and isolated Smith Island in the Chesapeake Bay. North of Crisfield is Janes Island State Park, with camping and kayaking trails through marshlands. At the southern end of the Chesapeake coast of Maryland, the town of Crisfield is home to a fishing, crabbing, and seafood processing industry. Various waterways provide a medium for commerce and boaters: the Atlantic Ocean; Chesapeake Bay; the Susquehanna River; and the Chesapeake and Delaware Canal. The Chesapeake Bay Bridge spans 4.35 miles (7.00 km) of the Chesapeake Bay, and at the time of construction in 1952, was the longest continuous over-water steel structure. A second parallel span was added in 1973 and a third has been discussed, most recently in 2006. A third span will not open, according to state officials, until about 2025. The bridges made Kent Island, site of the first English settlement on the Shore, into a bedroom community for Washington, Annapolis, and Baltimore. Kent Island is part of Queen Anne's County. The two major highways on the Eastern Shore are U.S. Route 13 and U.S. Route 50, which meet in Salisbury. The Salisbury-Ocean City Wicomico Regional Airport, in Salisbury,  is the only commercial airport on the Delmarva Peninsula. The Delmarva Shorebirds are a minor league baseball team who play Class A baseball in the South Atlantic League at Arthur W. Perdue Stadium in Salisbury, affiliated with the Baltimore Orioles. The 2005 film Wedding Crashers was filmed on locations at Maryland's Eastern Shore, including the historic Inn at Perry Cabin. Chesapeake is a novel by James A. Michener, published by Random House in 1978. The story deals with several families living in the Chesapeake Bay area, from 1583 to 1978. John Andrews, clergyman. Born in Cecil County. Erin Burnett, News Anchor. Born in Mardela Springs, Wicomico County. Gilbert Byron, "Poet of the Chesapeake"
William Claiborne, first English settler within Maryland. Settled in Kent County. Frederick Douglass, abolitionist. Born in Talbot County. Jimmie Foxx, baseball player. Born in Sudlersville, Maryland in Northern Queen Anne's County. Linda Hamilton, actress. Born in Salisbury, Wicomico County. Edward Lloyd, delegate to the Continental Congress. Born in Talbot County. Dale Midkiff, actor. Born in Chance Somerset County. Frank Perdue, entrepreneur. Born in Salisbury, Wicomico County. Former CEO of Perdue Farms. Harold Baines, baseball player. Born in Talbot County. ^ Lois Green Carr; Edward C. Papenfuse. "Philip Calvert (1626-1682)". St. Marys City. Archived from the original on 2008-04-19. ^ City on the Sand, Mary Corddry. Tidewater Publishers, 1991. ^ Ocean City History Archived 2008-05-13 at the Wayback Machine. ococean.com. Retrieved July 1, 2008. ^ MLB Top 100 Teams Archived 2008-06-22 at the Wayback Machine. MLB.com. Retrieved July 1, 2008. ^ "History of Moveable Feast". About Us. Moveable Feast. 2015. Archived from the original on September 18, 2015. Retrieved October 26, 2015. ^ "Data Files for the 2018 Gubernatorial Election Results". elections.maryland.gov. Retrieved 2019-01-05. ^ "2014 Gubernatorial Election". elections.maryland.gov. Retrieved 2019-01-05. ^ "2010 Gubernatorial Elections". elections.maryland.gov. Retrieved 2019-01-05. ^ "2006 Gubernatorial Election". elections.maryland.gov. Retrieved 2019-01-05. ^ "2002 Gubernatorial Election". elections.maryland.gov. Retrieved 2019-01-05. ^ "1998 Gubernatorial Elections". elections.maryland.gov. Retrieved 2019-01-05. ^ "1994 Gubernatorial Elections". elections.maryland.gov. Retrieved 2019-01-05. ^ Baltimore Sun - Chesapeake Bay Bridge Summary. baltimoresun.com. Retrieved July 1, 2008. ^ Michael Dresser (February 11, 1998). "Saying so long to city bullies". The Baltimore Sun. Archived from the original on January 11, 2013. ^ "Education Makers, Earl S. Richardson". The History Makers (www.thehistorymakers.com). Retrieved May 1, 2015. ^ "Paul S. Sarbanes, U.S. Senator (Maryland)". msa.maryland.gov. Archived from the original on 2 March 2018. Retrieved 4 May 2018. Wikivoyage has a travel guide for Eastern Shore (Maryland).